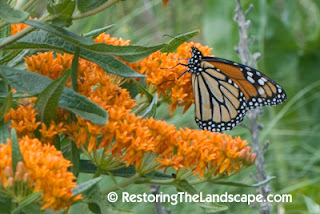 Monarch butterflies are the insect most frequently associated with Milkweed (Asclepias) species as a larval host. 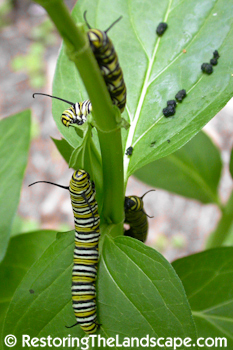 The Monarch caterpillars have an advantage over predators from eating Milkweed plants which contain a toxic milky sap that becomes concentrated in their bodies. The orange and black coloration of insects associated with Milkweed belong to a group called the "Monarch Mimicry Complex". Either they feed on milkweed or share the same black and orange coloration as Monarchs that allow them protection from predators. There are other insects who take advantage of the milky sap, or develop ways to 'eat around' the sap in order to consume Milkweed leaves. 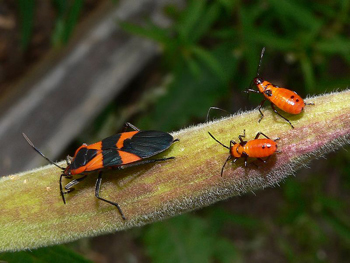 Two types of beetles are commonly found on Milkweed. 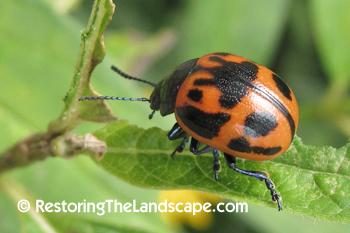 The first, pictured here, is the Milkweed Leaf Beetle (Labidomera clivicollis). 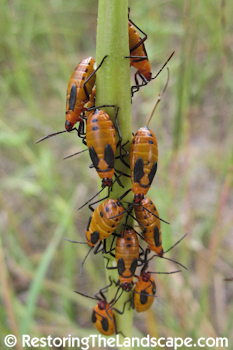 These beetles especially like feeding on Swamp Milkweed (Asclepias incarnata) although I have seen larva on Butterfly Milkweed (Asclepias tuberosa). We find adults in early July in our area and a second population in September. These beetles are fairly large and conspicuous, just over 1 cm in length. The black patterning on their backs can be variable in shape. The second photo is of a larvae. 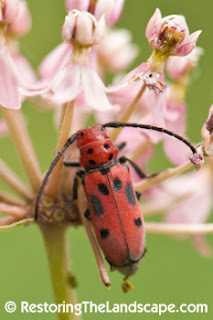 The other common beetle is the Red Milkweed Beetle (Tetraopes tetraophthalmus). This long-horned beetle also prefers Swamp Milkweed as well as Common Milkweed (Asclepias syriaca). I usually see these beetles in July in central Minnesota. They are red-orange in color, with four black spots (eyes) on their thorax. There are two bug species found on milkweed too. 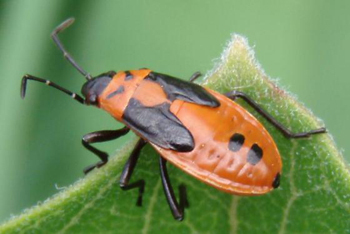 The Small Milkweed Bug (Lygaeus kalmii) is dark gray to black with an orange 'X' on its back. 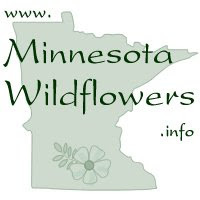 Look for adults in early summer on Swamp Milkweed. 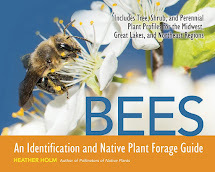 Adults lay their eggs on Milkweed in the spring and feed on the milkweed seeds. 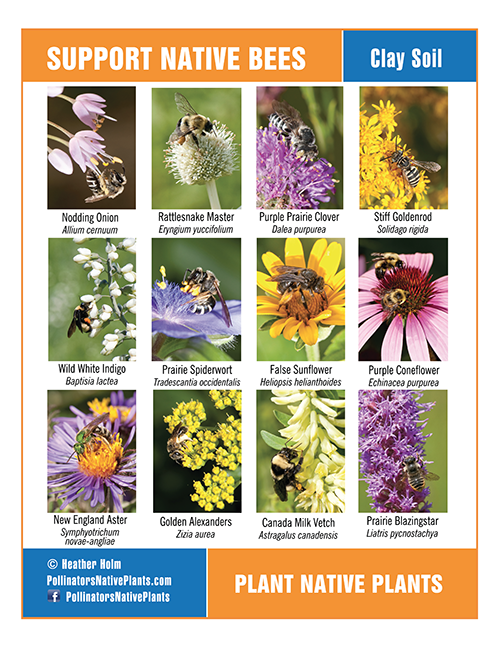 These bugs overwinter as adults. The larva look very similar to the Large Milkweed Bug. One difference is the two black angled marks on their thorax. 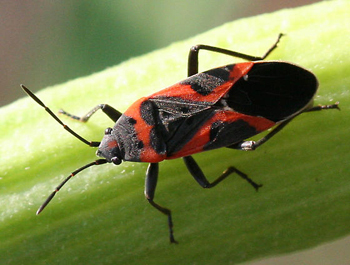 The second bug found on Milkweed is the Large Milkweed Bug (Oncopeltus fasciatus). It has a prominent black band through the middle of its wings. In late August the larvae can be seen in huge numbers on Milkweed pods. They are pictured here on Whorled Milkweed (Asclepias verticillata). These larvae mature into adults and overwinter in adult form. One generation per year. 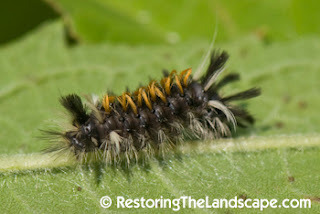 The last insect commonly found on Milkweed plants is a moth caterpillar, the Milkweed Tussock Moth (Euchaetes egle). These black and orange caterpillars are found in early August, most often feeding on Common Milkweed. The caterpillars "chew through major leaf veins to disarm the pressurized copious latex of the food plants." (Moths and Caterpillars of the North Woods) One generation per year in the north, caterpillars overwinter.